Spring arrived a few weeks early here in my little corner of the world when I found God Bless Our Easter by Hannah C. Hall. And no, Hannah is no relation to Cathy C. Hall. But I’d love to share a cup of tea and talk writing with her. Too bad Hannah’s all the way in Arkansas! Thankfully, her lovely book is here on my doorstep, so let’s take a look. In God Bless Our Easter, the most adorable baby animals ever playfully romp through a spring day. The rhyming text tells of their discovery of God’s blessings in rain puddles and shady naps, in sunny daffodils and soaring butterflies. 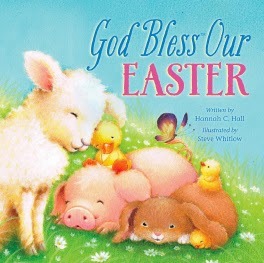 God Bless Our Easter is the perfect book for a toddler’s springtime basket, though it’s sure to find a place in your child’s heart through all the seasons. And thanks to the blessing of email, I did have a chance to chat with Hannah and ask her a few questions. When did you begin your writing journey? My mom predicted when I was a very little girl that I was going to grow up to be an author. I was always, always reading. I didn't get serious about writing, however, until college. When a professor I both respected and was terrified of told me I should to switch my minor to Journalism, I did as I was told! I wrote for my college newspaper and then transitioned into freelance writing for a few small magazines after graduation. When I started having children, my mom again encouraged me that I should write for kids. Having never taken a creative writing course, I didn't think I had the imagination to do it. However, as my kids and their imaginations grew, I found my inspiration. My "official" writing journey began after I pitched my first manuscript for a picture book at a conference. Though that particular story has yet to be published, I met an editor at a meeting there that resulted in the God Bless series, of which I'm now in the process of writing the fourth book. Moral of the story: go to conferences and listen to your elders! My process is certainly not very technical or structured. I'm a stay-at-home mom, so I do a lot of writing in my head while I fold clothes or wash dishes. I always keep a pad of paper and an ink pen by my side or in my purse. There is something about gliding a good ink pen over nice paper that inspires my creativity in a way a computer screen never can. Since I write a weekly blog, I am always thinking on that as well. What am I learning in the day-to-day from my children or about parenting or marriage that might be useful to someone else? I would hate to have these experiences (good and bad) and someone not get something out of it. I want to be real with people, and I really want them to learn from my (many) mistakes! I queried many agents, and I'm not sure I got even so much as a rejection letter from any of them. They simply never responded. It was very disheartening. I stumbled on to the amazing Sally Apokedak while checking out a conference that she happened to be speaking at. (Conferences, again!) She responded to my query very quickly, and I appreciated that so much. She is a writer herself, so she respects writers and the time (and nerve) it takes to send out queries. She is down-to-earth, truthful, and truly a blessing to me. A big thank you to Hannah Hall for sharing her blessings with us here at the Muffin! And P.S. 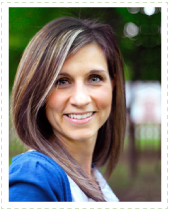 Sally Apokedak is our amazing judge for the Spring Flash Fiction Contest. So if Hannah’s inspired you today, why not pick up your pen and give springtime writing a whirl? You might be blessed with a winning story! Oh this is so cute. I'm going to buy it and save until I have a little one to give it to! Thanks you Hannah and Cathy Hall for this wonderful post. I love the illustrations and also the messages and would love to win a copy for my soon to be born great grandson. This book looks so sweet! lovely!